Determining the cause of the overload of the electrical circuit is essential. This guide is about troubleshooting why a circuit breaker keeps tripping. We have a 15 amp breaker that keeps tripping. This is something that just started happening. This is what feeds off that breaker: livingroom lights, 2 TVs, kitchen lights, fridge, washer, dryer, master bedroom, guest bathroom, laundryroom lights, all porch lights, and a new gas heater with an electronic ignition and fan. This is a 1977 doublewide mobile home. What could suddenly cause this to happen and is it dangerous? You bet your bippy that's dangerous! Unplug everything and get an electrician out there today to help you sort out what is overloading that particular breaker. My guess is that whomever installed the new gas heater didn't 'add' a new breaker for it exclusively. 2) you have way, way too much on that breaker! I would bet that the breaker trips when the heater comes on. The heater should be on its own breaker. I agree with everyone else, call the electrician now! I just moved into a brand new apartment, we are the first tenants to live here. In my bedroom I have a 47 inch TV, Xbox, surround sound system, alarm clock, cable box, laptop, desktop computer, and monitor (for the desktop), a total of 8 things plugged in. My 20 amp breaker would pop all the time, so I unplugged everything except my Xbox, cable box, TV, and my surround sound. It still tripped the breaker. So I thought it might be the surge protector I have so I got another one and it still tripped. Now I have used two surge protectors and two separate outlets and it still trips all the time. I currently have only three things plugged into two different surge protectors on two different outlets and it pops a lot less often, but I shouldn't have to do this. The breaker should easily be able to handle everything. I had an electrician come and check it out and they said everything was fine and it was probably something I had plugged in, but with my Xbox, TV, and surround it doesn't trip. If I add anything else no matter what, alarm clock, laptop charger, anything it trips. It's really getting old. Any suggestions? The breaker only runs the outlets, nothing else, no lights or anything. In order to decide how big of an electrical service is needed in your home, one has to do a little math homework. Calculating how much power both you and your electrical appliances use is necessary to calculate this number. I'm often asked how to figure this load. It really is pretty simple if you know what to look for and how to add up the loads. The first thing to know is that circuits should only be loaded at 80% of the total circuit load. To help you understand the concept, if you have a 15-amp circuit, the safe operating amperage would be no greater than 12 amps. The total wattage would be 1,800 watts, meaning the safe wattage usage would be 1,440 watts. If you have a 20-amp circuit, the safe operating amperage would be no greater than 16 amps. The total wattage would be 2,400 watts, meaning the safe wattage usage would be 1,920 watts. On a 30-amp circuit, the safe operating amperage would be no greater than 24 amps. The total wattage would be 3,600 watts, meaning the safe wattage usage would be 2,880 watts. Your home will likely also have 240-volt appliances like water heaters, air conditioners, electric dryers and electric ranges. These too will have an amperage rating label and the wattage can be calculated. The voltage, 240 volts, times the amperage, say 30 amps, will equal the wattage requirements. I have girls and they keep tripping the 20 amp breaker. I made sure there is 12 gauge wire and there are only two receptacles on this circuit. But when the girls plug in both hair dryers and curling irons it blows the breaker. Will I have to run a dedicated line for each receptacle? A hairdryer is nominally rated 1500watts; according to the NEC, the breaker has to be rated at least 80% greater than the load. Hence, 1500w divided by 120vac = 12.5 amps x 125% = 15.63 Amps (minimum rating for the circuit breaker) Now if you have TWO hairdryers (12.5A x 2 = 25 Amps) on the one 20A circuit breaker, you'll trip every time. If you don't, then you really have problems. You could run #10 Romex and change out to a 30A circuit breaker but that will put the breaker at maximum capacity. It may make more sense to leave the #12awg, change the circuit breaker to a 25amp rating and run an identical separate circuit of the same. Otherwise you will keep having issues. My breaker keeps tripping. My air conditioner is on a 15 amp circuit and it goes out every 6-19 minutes, and then I will have to reset. It also takes out the living room, kitchen, and bathroom lights. This is in a one bedroom apartment. I have unplugged everything in the bedroom, bathroom, and kitchen except for the fridge, but it still goes out. What to do? Actually contact your apartment manager and he should have maintenance check it out for you. Unless you own the apartment, instead of renting it is his responsibility. We have a 3 bedroom house and my son's family started living with us. Before this we were only using 1 bedroom. Now there is a 110 volt window unit in every room, AT&T U-verse TV in every room, plus naturally the lights. The breaker started tripping (15 amp) so we bought a new one. The new one is tripping now. Help! What to do? Can we go up to a 20 amp breaker? Do not put in a 20 amp breaker. Breakers are sized to protect the size of wire in a circuit. 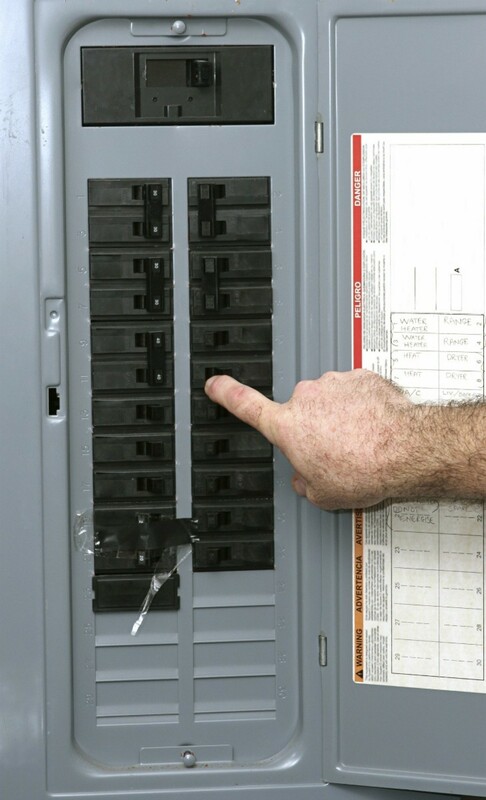 In general 15 amp breakers are used to protect 14 gauge wire, 20 amp 12 gauge. You most likely have 14 gauge wire and over sizing the breaker is dangerous and can lead to short circuits and fire. The answer is to use fewer appliances, especially a/c units or have more circuits put in, maybe even a dedicated line for each a/c unit. I just moved into a 1950s house. All the electric seemed to be working fine until carpet was installed yesterday. The circuit breaker flipped and flips again immediately after each attempt to turn it back on. There is no power being drawn on the circuit. It is only feeding overhead lights and outlets with nothing plugged in. I have an outside vapor light my husband installed on one end of our barn. The light is on a separate breaker with just the light and a plug on it. I have noticed the past few nights after it has been on about 6 hours the light goes out. When I went to check on it the next morning the breaker had tripped. My husband had put another vapor light on the other end of our barn and it is fine; it also is on a separate breaker. We have a breaker box with about 20 breakers in it and so far none have tripped except the one. Something is causing that breaker to trip-don't take the chance of a fire or electrocution, call a pro in to find out what is wrong. The breaker to our living room and patio has tripped twice at night. Once my husband just flipped it back on and it was fine. The next night it happened again and will not flip back on. The things on the breaker are just standard things (TV, 2 lamps, an overhead light and fan, as well as, the overhead lights and fans on patio). We can't figure out why it won't flip back on or why it is tripping at night when everything is off. Any ideas? Oh, and this is a new construction home. We have been in it 1 1/2 years. Usually you will find it on the outside part of the things you mentioned. A bug or spider in the fixture. Turn the breaker off and clean all the fixtures outside including the plug ins. Moisture sometimes causes the wires to corrode, usually something simple like that if it hasn't been doing it before. I do my own and there is no risk as long as the breaker is off. I live in a three bedroom deluxe seven room plus basement altogether. So I just got my circuit breaker replaced because it was going out. The workers put in new one. I keep small heaters on, but now that it's been replaced I can't use the microwave or my room, kid's room, parts of my mom's room, part dinning room, kitchen, and basement goes out. The guy who fixed it put it on 15amp. Should it be all on one like that? No, it should not. It might be a good idea to figure out what is all on that breaker. From my experience, a microwave takes a lot of power. Perhaps, in the short term, you can plug that microwave into a different outlet that is not on this circuit. I have too many outlets on one breaker, and I am going to have the electrician come in and add more circuits (put in more breakers). This may be what you need to do. We have a circuit breaker that all of a sudden keeps tripping. The breaker box goes directly to the power pole and the only thing on the problem circuit breaker is the pump for our well. We've had this pump on this breaker for 15 years and just started having a problem in the last few days. We already tried replacing the circuit breaker. We replaced it with a 15 amp breaker because that's what was in there before. That did nothing. Can anyone help please? The breaker is tripping from overcurrent. If it trips immediately, it is most likely a short to ground. It could also be a locked rotor on your pump. If it takes time to trip, it is an overcurrent, and for some reason the pump is working harder than it used to. Maybe buildup within the pump or bearing failure. Look for physical damage of the cable feeding the pump from the breaker. If none is found, have an electrician megger the leads to the motor to see if you have a short to ground. If you do not, you may need to have someone pull the pump and have the motor tested and/or replaced. If it has been the same pump for 15 years, it may be at the end of its life. I bought my house a year ago. The electrical box was replaced because it did not meet code as well as some wiring and new outlets were installed. I have had absolutely no issues, never blown a breaker or anything. I came home tonight to find only some of my house working. Half the kitchen, half the living room, half the basement, and my garage door won't open. I checked the electrical box and a breaker blew. I reset it and switched it back on and all it does is spark a little and shut right back off. I unplugged eerything in my house and waited a few hours and tried again and still nothing. I live in Illinois where we've had the worst winter ever, averaging 70 inches of snow over the course of winter. Today however it reached around 50 so everything was melting and water just pouring down my house non stop. I read there is a box outside as well. Could that be an issue? Or a bad breaker? Please help! The electrician wants $150/hr. That electrician might be worth every cent of that $150 /hour. Since you have had no serious issues before, and have just had everything replace, this sounds like a serious issue to me. I'd call the electrician. You may have something dangerous going on - better a big bill than a house on fire. My trailer house has a breaker box in my trailer for different parts of my trailer, but it keeps tripping the breaker box on the outside pole that my trailer is plugged into. If I have the dryer and AC on it trips. If I have the microwave and washer on it trips and I have to go outside to reset the switch. Help. Those appliances are pulling to much power. You or the owner of the trailer park need an electrician to up the ampage to the outside pole or to the house. I have a 7.5 Kw motor started by a control circuit with breaker. The breaker is tripping while I stop the motor. What is the cause for this? There's an electrical problem of some sort that could be dangerous, that's why the breaker is tripping. Have the motor checked soon.